For other uses, see URL (disambiguation). 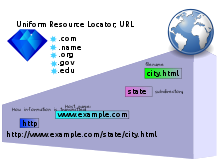 A Uniform Resource Locator (URL), colloquially termed a web address, is a reference to a web resource that specifies its location on a computer network and a mechanism for retrieving it. A URL is a specific type of Uniform Resource Identifier (URI), although many people use the two terms interchangeably. [a] URLs occur most commonly to reference web pages (http), but are also used for file transfer (ftp), email (mailto), database access (JDBC), and many other applications. Uniform Resource Locators were defined in RFC 1738 in 1994 by Tim Berners-Lee, the inventor of the World Wide Web, and the URI working group of the Internet Engineering Task Force (IETF), as an outcome of collaboration started at the IETF Living Documents Birds of a feather session in 1992. The format combines the pre-existing system of domain names (created in 1985) with file path syntax, where slashes are used to separate directory and filenames. Conventions already existed where server names could be prefixed to complete file paths, preceded by a double slash (//). Berners-Lee later expressed regret at the use of dots to separate the parts of the domain name within URIs, wishing he had used slashes throughout, and also said that, given the colon following the first component of a URI, the two slashes before the domain name were unnecessary. An early (1993) draft of the HTML Specification referred to "Universal" Resource Locators. This was dropped some time between June 1994 (RFC 1630) and October 1994 (draft-ietf-uri-url-08.txt). A web browser will usually dereference a URL by performing an HTTP request to the specified host, by default on port number 80. URLs using the https scheme require that requests and responses be made over a secure connection to the website. Internet users are distributed throughout the world using a wide variety of languages and alphabets and expect to be able to create URLs in their own local alphabets. An Internationalized Resource Identifier (IRI) is a form of URL that includes Unicode characters. All modern browsers support IRIs. The parts of the URL requiring special treatment for different alphabets are the domain name and path. The domain name in the IRI is known as an Internationalized Domain Name (IDN). Web and Internet software automatically convert the domain name into punycode usable by the Domain Name System; for example, the Chinese URL http://例子.卷筒纸 becomes http://xn--fsqu00a.xn--3lr804guic/. The xn-- indicates that the character was not originally ASCII. The URL path name can also be specified by the user in the local writing system. If not already encoded, it is converted to UTF-8, and any characters not part of the basic URL character set are escaped as hexadecimal using percent-encoding; for example, the Japanese URL http://example.com/引き割り.html becomes http://example.com/%E5%BC%95%E3%81%8D%E5%89%B2%E3%82%8A.html. The target computer decodes the address and displays the page. Protocol-relative links (PRL), also known as protocol-relative URLs (PRURL), are URLs that have no protocol specified. For example, //example.com will use the protocol of the current page, either HTTP or HTTPS. ^ A URL implies the means to access an indicated resource and is denoted by a protocol or an access mechanism, which is not true of every URI. Thus http://www.example.com is a URL, while www.example.com is not. ^ "Forward and Backslashes in URLs". zzz.buzz. Retrieved 19 September 2018. ^ a b Joint W3C/IETF URI Planning Interest Group (2002). ^ Miessler, Daniel. "The Difference Between URLs and URIs". ^ a b Berners-Lee (2000). ^ Berners-Lee, Tim; Connolly, Daniel (March 1993). Hypertext Markup Language (draft RFCxxx) (Technical report). p. 28. ^ Berners-Lee, T; Masinter, L; McCahill, M (October 1994). Uniform Resource Locators (URL) (Technical report). cited in Ang, C.S. ; Martin, D.C. (January 1995). Constituent Component Interface++ (Technical report). UCSF Library and Center for Knowledge Management. ^ RFC 3986 (2005), §3.2.2. ^ a b W3C (2008). ^ Steven M. Schafer (2011). HTML, XHTML, and CSS Bible. John Wiley & Sons. p. 124. Retrieved 12 October 2015. "Berners-Lee "sorry" for slashes". BBC News. 14 October 2009. Retrieved 14 February 2010. "Living Documents BoF Minutes". World Wide Web Consortium. 18 March 1992. Retrieved 26 December 2011. Berners-Lee, Tim (21 March 1994). "Uniform Resource Locators (URL): A Syntax for the Expression of Access Information of Objects on the Network". World Wide Web Consortium. Retrieved 13 September 2015. Berners-Lee, Tim; Masinter, Larry; McCahill, Mark (August 1998). "Uniform Resource Locators (URL)". Internet Engineering Task Force. Retrieved 31 August 2015. Berners-Lee, Tim (2015) . "Why the //, #, etc?". Frequently asked questions. World Wide Web Consortium. Retrieved 3 February 2010. Connolly, Dan; Sperberg-McQueen, C. M., eds. (21 May 2009). "Web addresses in HTML 5". World Wide Web Consortium. Retrieved 13 September 2015. Internet Assigned Numbers Authority (14 February 2003). "Completion of IANA Selection of IDNA Prefix". IETF-Announce mailing list. Retrieved 3 September 2015. Berners-Lee, Tim; Fielding, Roy; Masinter, Larry (August 1998). "Uniform Resource Identifiers (URI): Generic Syntax". Internet Engineering Task Force. Retrieved 31 August 2015. Berners-Lee, Tim; Fielding, Roy; Masinter, Larry (January 2005). "Uniform Resource Identifiers (URI): Generic Syntax". Internet Engineering Task Force. Retrieved 31 August 2015. "An Introduction to Multilingual Web Addresses". 9 May 2008. Retrieved 11 January 2015. Phillip, A. (2014). "What is Happening with "International URLs"". World Wide Web Consortium. Retrieved 11 January 2015.